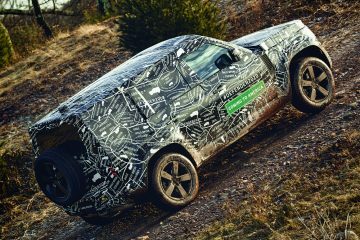 It’s telling that Land Rover first presented its 1948 model at the Amsterdam Motor Show. Export sales would be critical for the Rover Car Company in post-war Great Britain and one early customer that year was the Helka dealership in Iceland. That first Land Rover had the registration plate L-4, and thanks to the Gunnlaugsson family, 71 years later it’s still in use in its adopted home in the little town of Hvolsvöllur, in southeastern Iceland. 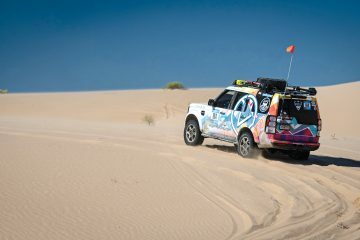 Here’s how their Land Rover enthusiasm grew. As a child in the 1960s, Gunnlaugur would find himself helping a farmer who lived and worked near Hvítserkur, in the north of the island. 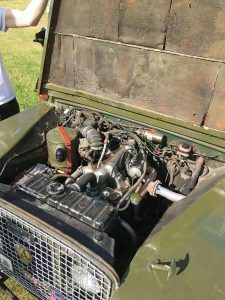 Like every other farmer back then, he owned a Land Rover, in this case, a ’64 Series IIA. Its Sand paint exterior stuck in Gunnlaugur’s mind, eliciting a combination of nostalgia and idealism. Back then he found it luxurious and fun to drive, but latterly it became synonymous with a simpler time and wholesome adventures. He dreamed that one day he would have one just like it. 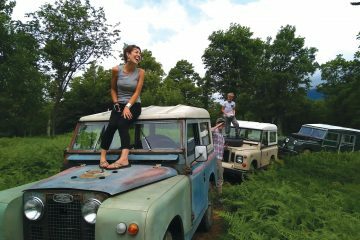 Since this foray into Land Rover ownership, the family has also owned Range Rovers, Discoverys and Defenders. Their first Defender came to them almost by accident in 2007. 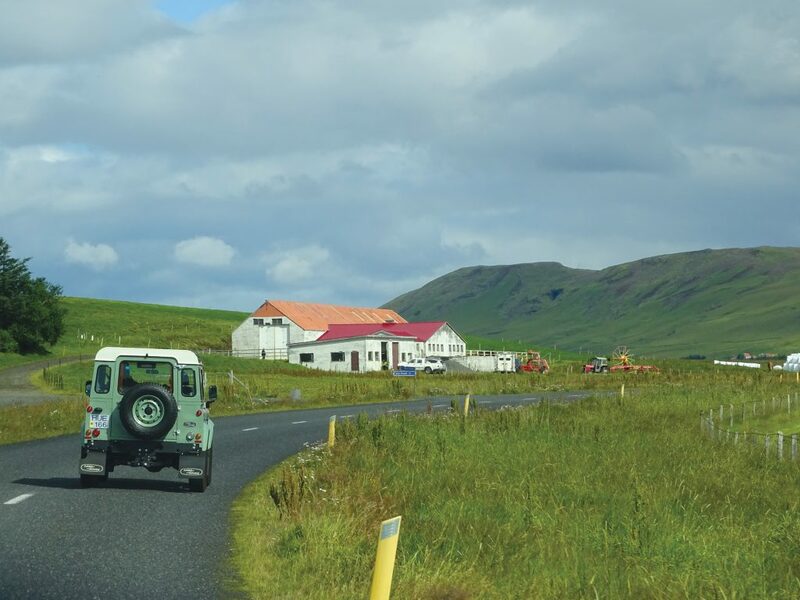 Someone had ordered a 5-seater Defender 110 from the Reykjavik dealer, but somehow the dealership had procured a utility spec’d vehicle, one without back windows instead of the desired station wagon. When another was ordered for the customer, Gunnlauger bought it. It proved perfect as a daily driver and as a utility vehicle through which to explore Iceland’s wild landscapes, in pursuit of outdoor recreation from mountain biking to salmon fishing. 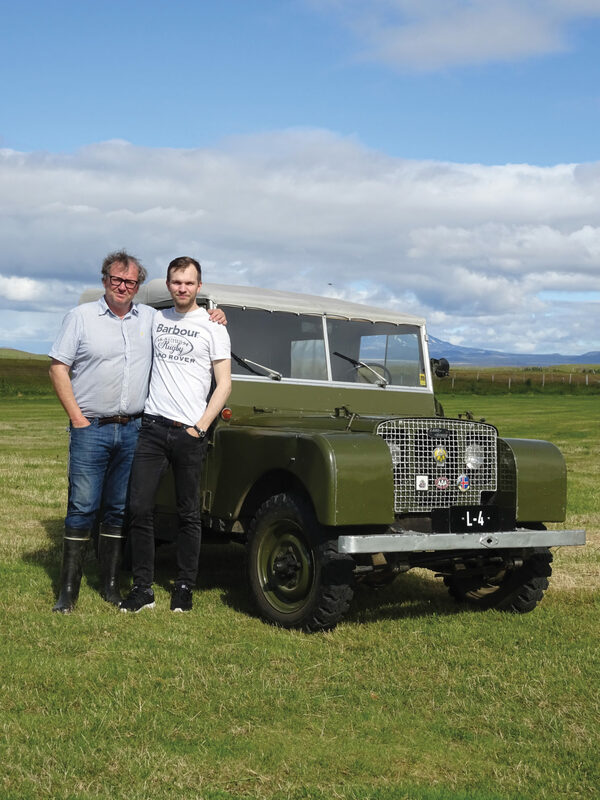 While finishing the final year of his Master’s in law from Reykjavik University, Pétur also serves as a fishing guide during the summer on the Þverá River and the Defender serves as his work truck. 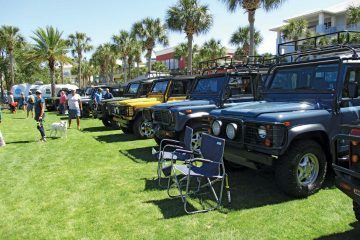 The family has, over time, amassed a fair number of classic Land Rovers, mixed with an FJ-40 and flat-fender Willys Jeep. They reside at the family’s country home near Hvolsvollur, 65 miles southeast of Reykjavik and in the shadow of the majestic, snow-capped peak of Mt. Hekla, one of Iceland’s most active volcanoes. There I met the family last summer, enjoyed their Land Rovers and dined on home-smoked wild salmon, caught during one of their Land Rovers excursions. 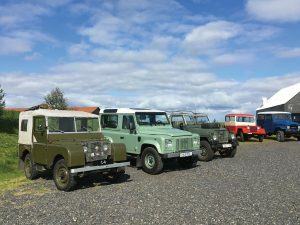 Their well-earned Land Rover enthusiasm paid off when BL EHF, the main dealer in Reykjavik, approached them as the sale of an L4, the ’48 Series I, became imminent. Back in the 70s, before such things mattered, it had suffered an unsympathetic refurbishment, including a bad paint job, a seemingly handmade and ill-fitting canvas hood, and silver paint covering the galvanized bits. It lacked a rear taillight and had gained ugly, aftermarket sun visors. 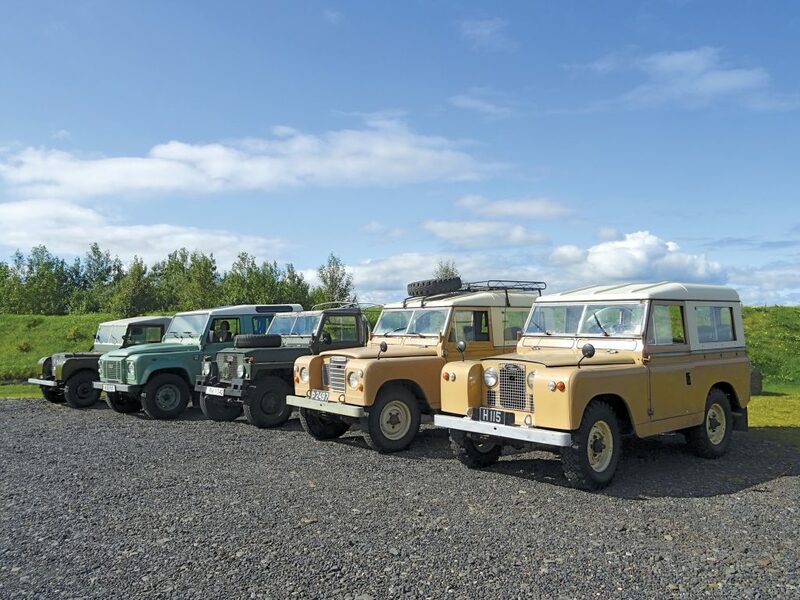 Nonetheless, the family could not pass up the opportunity to own this piece of Icelandic Land Rover history. Despite its bodywork that sets the nerves of rivet counters jangling, it’s mechanically sound and a reliable runner. Pétur jokes that it might one day be a candidate for the Jaguar Land Rover Reborn Programme. Family members enjoy undertaking small repair and maintenance tasks, but choose generally to use one of the several Icelandic Land Rover experts and enthusiasts, especially the Eðalbílar company, for major repairs such as the drivetrain. They purchased a ’79 ex-Dutch Army Lightweight, spotted languishing in a used car dealer’s lot — next to a Toyota Prius. Nothing is known of its service history, though it was only latterly imported to Iceland. 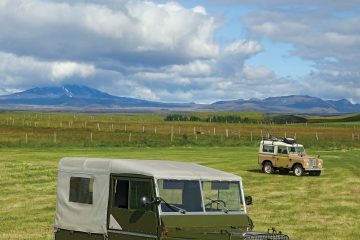 Most recently they gained a ’74 Series III, also in Sand, bought sight-unseen by Pétur’s mother as a birthday present for Gunnlaugur. It was in the north of Iceland, so was sent on a trailer to Reykjavík. Sadly, while it presented as a “nice straight Land Rover,” it turned out to have serious engine issues and was sent to a repair shop. Somehow the shop’s repairs failed miserably and the family ended up with a brand new engine for it! This has subsequently become their favorite. 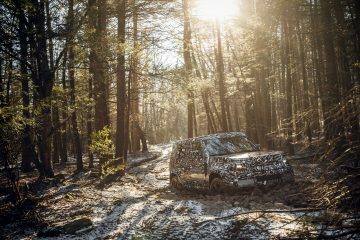 When news broke in 2015 that Land Rover Defender production would cease, a family wag suggested they should get a “last” to go with the “first”. Whatever the motivation, they placed an order the moment they saw the first Heritage Edition promotional material. The resulting Grasmere Green Defender now completes the line-up of pedigree vehicles. After buying the sublime Icelandic private registration, “HUE 166” formed the finishing touch. The “complete line up” might be temporary; Pétur looked wistful when he spoke about hardtop Series I’s (Icelandic sheep farmers preferred them to soft top Jeeps in period) so it wouldn’t surprise me if the stable door were opened again sometime to let in just one more pedigree beast. 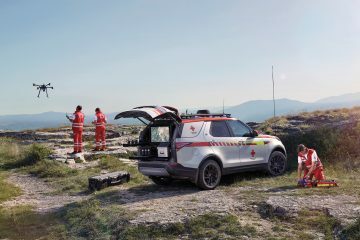 Of course, there is also the new Defender being launched. Pétur said, “I hope it will be simple. When we go fishing we like to sit on the wings and not be afraid to scratch it. We want to feel like we could fix something ourselves if we are away from the road. It should have a similar seat position to the old Defender, looking beyond the bonnet so that we can see our way through fords and rough terrain.” He thinks it will be hard to replace the original and to make a vehicle that meets environmental and safety regulations, but it will give the family something to dream about during those long Icelandic winters.